Cloth Diaper Revival: December Citrus Lane! This post contains affiliate links. By clicking the links on this page, you are helping to support this site. 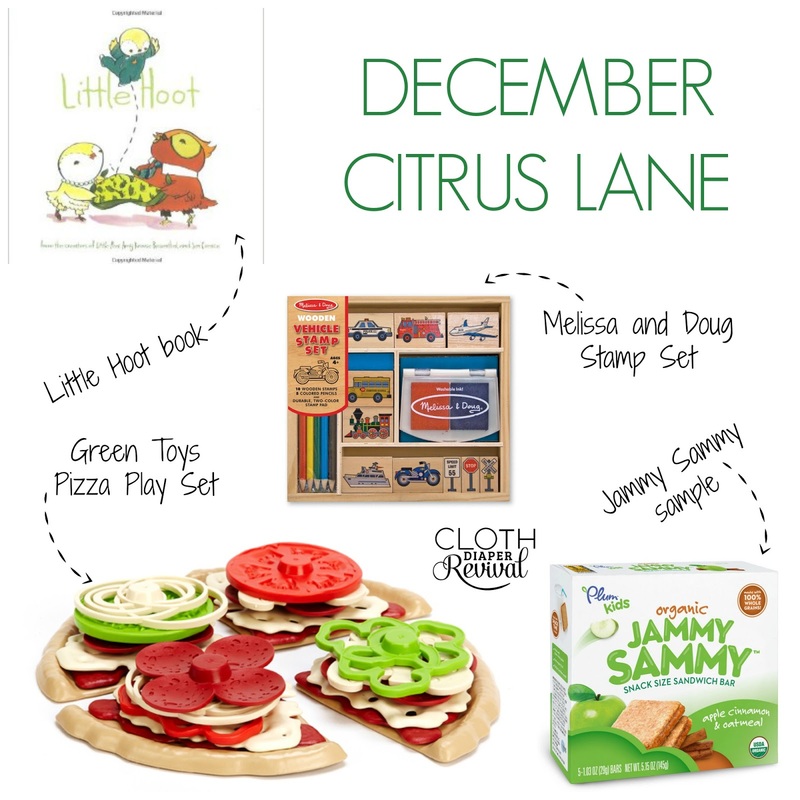 December marks two years that we've been subscribing to Citrus Lane! We've had our ups and downs along the way, but this month was definitely a hit! Recently, Citrus Lane was sold to a new owner, so I've been expecting some changes. I wasn't sure if they would be good or bad, but overall I'm pleased with how things are going! Here's what's in the box! Green Toys Pizza Play - This is a Citrus Lane exclusive set. It's just a smaller version of Green Toys Pizza Parlor. We got half the pizza and some ordering sheets, no pizza box or pizza cutter. It's still a great set without those things! I'm planning to use this as a stocking stuffer next week! Melissa and Doug Stamp Set - This was a customizable option this month and I knew it was coming before the box arrived! I got the choice of which set I wanted (vehicles, animals, or dinosaurs). I choose vehicles because my son is obsessed with trains! Chronicle Books Little Hoot - I absolutely love all books by Amy Krouse Rosenthal! If you haven't read Little Pea you are missing out! So I'm super excited to receive Little Hoot! This is a paperback version. I heard the younger boxes received board books! Plum Organics Jammy Sammy - I love when Citrus Lane sends new snacks to try! We've discovered so many new treats and the sample sizes are perfect for throwing in my purse or keeping in the car. My son loves peanut butter and jelly, so I'm sure he'll love this snack too! The total value of this box is about $32. Not the most valuable box I've seen, but still a great box! One month of Citrus Lane costs $29 if you pay full price. You can save 50% off your first box by signing up using my link. $32 worth of products for $14.50 is an awesome deal!